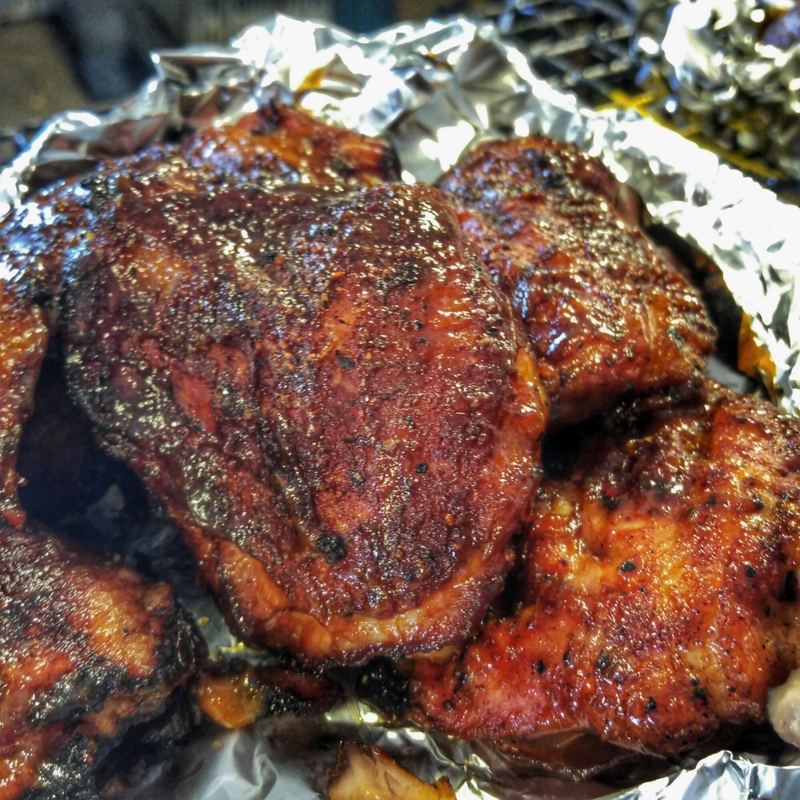 After my success with the chicken drumsticks yesterday and talking to one of my lobstermen, Mark Ring suggested chicken thighs on the BBQ. I asked my good buddy Eric Lorden to look for a new rub at the Restaurant Depot and he came back with Lowrey’s Chipotle Cinnamon Rub $20 for a huge 27 oz. container on Amazon. Ingredients Salt, sugar, brown sugar, spices (including chipotle chili pepper and cinnamon), paprika, onion, garlic, and vinegar. I was looking for a rub that would be a little different than the straight spicy hot Paul Prudhomme’s Blackened Magic Rub that I’ve been using on just about everything. With the second two ingredients being sugar and brown sugar this figures to be the sweet one to provide a little change-up. One whiff once you take off the cap gives a big hint of the sweet/savory goodness that was bottled up. An hour in with grill temps between 325-350 degrees. 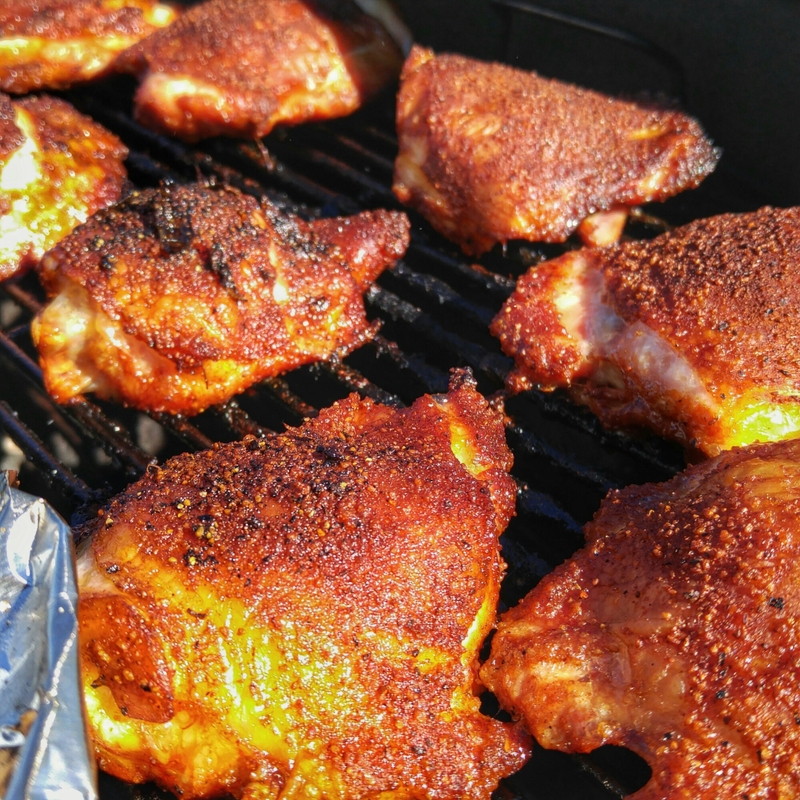 The rub is great if you’re looking for a little more sweet and a little less kick-you-in-the-nuts hot. It was a 4.5 lb package and only cost $6 for about ten chicken thighs. Outstanding value and delish!